Csaba Patkos, Team Lead Syneto, is a technical practitioner with 15 years of experience in the field. 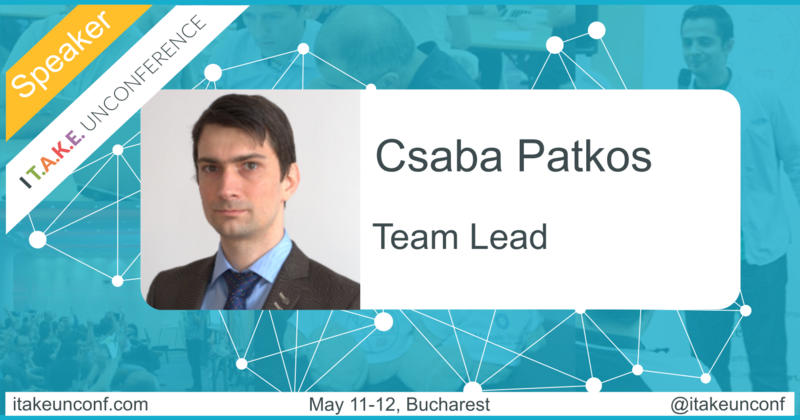 Joining #itakeunconf 2017 as speaker, he will share more in his talk about his experience of growing up as a team leader, mentor, and coach for the team he works with daily. Reading … I mean a lot. 40-50 books / year are doable. They can mix in a few novels / literature as well. Made plans and fought to achieve them. Think about where you want to be in 6 months or 1 year and define the steps you need to take to get there. I love programming and software engineering. I do it daily, with dedication. Built some useful daily habits that are helping me to get better. For example listen to audio books when driving, daily reading, daily plan of work, etc. Talked to the people I admire and I used these talks as sources of inspiration. So, don’t be afraid to approach your professional idols, they are people just like you. √ Some people just won’t listen to you. √ Some people just want to force their ideas on you. √ Some people don’t care about the topic, they just pick fights with you. √ Some people think you don’t care, even though you really do. Want to join Csaba and ~300 software crafters from around Europe?